Plan B required, as Killa knocks back Toon to stay with Blades? | NUFC Blog. Plan B required, as Killa knocks back Toon to stay with Blades? 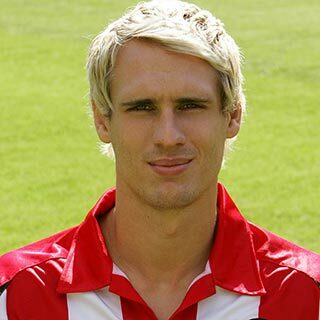 News today from a number of sources seems to indicate that the Toon’s move for Sheffield United’s coveted defender, Matt Kilgallon, has collapsed. Newcastle had reportedly made a bid of around £1 million for the player, who is out of contract in the summer, and could be snapped up on a free transfer in 6 months. This seems kind of fishy to me and has the stench of an agent trying to get the best deal for himself. After all, such a committed player has refused to sign a new contract and could leave his current club in the summer, earning them no money whatsoever. I like to think the best of people, so perhaps the lad is comitted to The Blades after all? Now surely if Kilgallon wants to “enjoy the best years of his career” playing in the Premier League, then Newcastle may be the best place for him? I mean that with no disrespect to Sheffield United. Perhaps, as I said, the agent is trying to manufacture the best possible deal for himself. If the player leaves for free in the summer, then that is generally reflected in the player’s new club paying a slightly higher signing-on fee, something the agents no doubt get a slice of! Either way we can only take this statement on face-value, but it certainly looks like Newcastle have suffered a setback in our early transfer-window efforts to bolster the squad. So what of a contingency, assuming we have one, and which alternatives do we have lined up for this eventuality? Enrique Calls For Backup As Colo Turns Down Real! And we’re off! – Toon submit bids to Leeds and Sheffield United. Campbell and Kilgallon – latest Toon transfer targets. Kilgallon turns to the dark side? What happened to the original headline, Toonsy? It was very good. translated – its about money. Stardust – Absolutely. Agents are only interested in one thing! It could also be translated into ‘He thinks NUFC is a basket case with no plans for the future’. Although I doubt footballers are too bothered about things like that as long as they get paid. what was the orginal headline? We will end up with a couple of ropey loan signings at the end of the window. There is no intention to splash any cash. Lets see ! what`s that about ? He`s gonna stay and see who gets promoted, eh ! Or see if anyone else wants him as a free agent, where lack of any fee could result in a larger salary. So whats in it for his agent, who aint gonna get a percentage of any transfer fee. Whatever, they have probably got a deal worked out. Unless of course it`s an attempt to sweeten the deal that could go down during this window. A bid of around 1m., he`s worth more than that, so sweeten the deal Mike. Basically, he’s waiting to see who goes up before moving. It’s no good to him signing a 4 year contract with us and then us inexplicably not getting promoted. And now we have supposedly made a 3rd bid for Beckford. 3rd £1.5 million apparently = ? I bet Ashley is baulking at thought of paying that much! Yeah on contemplating it`s about the offer, not enough, agent wants a bigger cut. The deal I dont care about is for Beckford, watched a re run of the Man.U.game was not impressed, really no better than what we have. We need a striker badly and have the opportunity to sign a future star in Moses, what may look like a lot right now will seem the deal of the decade later. But a combination of parsimony and shortsightedness will no doubt, put the kebosh on that going down. Good comment mate,totally agree it’s all about personal terms. The same will happen with Beckford, he will stay with Leeds until the summer and then negotiate a free where he will receive a hefty signing on fee and a better wage salary. A LA Geremi me thinks. for what it’s worth although he’s a good player I just wish he had signed for you boys. At least then we can get on with replacing him with someone who really wants to play for Sheff United. Thats fine, but then he becomes a risky signing if he waits until we’re up as he is relatively unproven at premier league level. Would he get a game ahead of Colo and Taylor now, let alone in the premier league? – Risk of being tied into a deal with a club not yet promoted and still very much in disarray in many respects. – More money for signing-on fee in the summer. – No guarantee of 1st team football if he comes here. You can see why he’d be reluctant but there’s the prospect of better wages, Premiership football, playing at sizeable and passionate club like the town. The agent would have swayed him ultimately, over a few cheeky beers, because it means more financially to him. But like Stu79 said, it could just be a means to get more wedge from us. He’s barking up the wrong fat basket if that’s the case. NevtheBlade – I dont want to get into an argument, but Kilgallon is not better than Colo.
Colo and Enrique have been in a different class to most Championship defenders this season. Haven’t seen much of Kilgallon to be fair but reports are good. And last season you could have named any Championship defender and I’d have said they were probably on par with Colo, and in some cases far better. But this season he’s been immense, and truly made me eat my words. Commitment, class, composure, quality, the works. So I’d be surprised if there were any better than him. He’s certainly better than most I’ve seen in games we’ve played so far. Enrique is a different class altogether. No way is Kilgallon a better option at left back. Simply because there can’t be as good a left back knocking around down here. batty – just as well you divent want him, cos you haven’t got him ! Doesnt matter if its Kilgallon or Beckford, once again the powers that be have leaked the names to the press before they were signed and the manager also confidently predicted that his number one targets would be sorted at the beginning of the window rather than the end. One thing about Keegan, the player was in the bag before anyone knew about it not like this shower of shite. They will once again be running around like headless chickens, pannicking towards the end of the month and certain posters on here have been praising the supposed era of stability, what a laugh! NevtheBlade – aye that’s the strange thing eh? I had assumed this was nailed-on since the summer. Seemed like he was always intent to leave and that he fancied it up here. Strange backtracking? Probably not when you consider the agent is heavily involved. Fair play on the left-back thing. Honestly, Enrique is like Roy of the Rovers from left back. He’s the main reason I tramp up 400 steps every home game. Otherwise it might get too grim. bigbadbob > Doesnt matter if its Kilgallon or Beckford, once again the powers that be have leaked the names to the press before they were signed and the manager also confidently predicted that his number one targets would be sorted at the beginning of the window rather than the end. as for Killa and Beckford im not that fussed on Killa as we have better and I dont think he would be happy warming the bench. Beckford I dont want I think he would be another flash harry than thinks he is better than everyone else, we have been there before. I’ve actually met Enrique. It was the Sunderland game at SJP and i was having a pre match pint in the Fluid bar when he walked in. He lost a set of keys for his big Porsche Cayenne that was parked outside and the doorman went round asking everyone if we had seen them. My mate used that opportutnity to barge a kid of about 4 years old out the way and grab a photo, which i took for him. My mate is 24 by the way but acted like a teenager at a pop concert just to gat close. I still rip him about it from time to time. Am i the only one glad that we’re not getting him, imo signing killa would have just paved the way for colo to be sold. 1 million for killa, maybe 6-7 for colo. 10 grand a week for killa, and 80 grand for colo. it’s a cashley special, the fat man’s probably in tears! “He was saying how he didn’t like the cold but he didn’t mind as there won’t be snow much longer. He’s either close friends with Wincey Willis or he is moving back to Spain! We had some crack about food and whether he’d been to Greggs. He said Steven Taylor and Shola had made him eat ‘Piss Pudding’. I think he meant ‘Pease Pudding’ but we kept a straight face. Beckford has just handed in a transfer request….! Bloody hell, he has n’all! Beckford hands in transfer request. BBC page. The Alchemist – ta, guess I might be need to chuck up an article! We could be forgiven for thinking all agents are slimey, money driven, soul-less people who only ever talk about transfers when it means there’s all the more money for them to take from the deal. … Then forget it, we don’t want any more players like that. We need to say to Kilgallon, listen son, we’ll offer only up to £2million for you, if you don’t want to be part of our club or don’t like our improved wages, you won’t get another chance in the summer or near future. Maybe that will give the kid a reality shock and weigh up out of NUFC and Sheffield Utd (no disrespect) who he’s going to have more of a prolific career with. On a personal note though I think Kilgallon could potentially be worth up to £3M and anything around the £2.5M mark for him would be great business. @ We could always play S. Taylor at RB he has always looked good there and got further forward than simpson does! Think Beckford is worth a punt! Alchemist, Taylor reminds of Enrique when he goes forward in the sense that, JUST KEEP RUNNING! seems to be his philosophy :) He’s a strong and as demonstrated quick player, so can do the getting forward, it’s just the getting back and final ball that means I don’t think RB is a natural suited position for him. I’d get Beye back on loan. O’Neill should do it as a favour just for getting Harewood off his hands. worky – we’re obviously not top of newsnow’s list. Would love to have Beye back..but at the end of the day he made his bed.. The Bench at Villa or a hero up here! Yeah Taylor isn’t a natural RB but could handle anything in this league. Allows us to accomadate Kilgallon, wouldn’t want him in summer though! Yeah I suppose Alchemist but I do rate Simpson and would think it unfortunate to be playing Taylor out of position to accomodate a player who doesn’t seem exactly head over heels jumping at the chance to join. Manu want him to play defense. He’s ok if all you expect of him is goal attempts – can be lazy with a bad attitude. Sounds like a certain pie man who played for both clubs Vid??? If we have submitted £1.25 million as sky have reported we have no chance…I said from day 1 my gut feeling is he will go to the premiership. Point taken Nev-so you wouldn’t have him in your squad then? We represent his absolute best option. He obviously wants out, master bates is trying to play fast & loose. They should take the money offered, it’s good money for someone out of contract in months. leeds fans are bound to be bitter about him, it’s their prerogative. Him playing in the chumpionship, with a good chance of getting into the prem is the perfect situation. Rather than way too much expectation on him going straight to the prem. Good! Don’t want another a-se that does not want to play for the shirt, been bred on those for last decade. The money is the key here, at least we will hopefully get players that want to come and play. Probably not good ones but they will try! I really was surprised we went for him in the first place. I certainly hadn’t heard of him before our interest and the games of Sheff Utd I’ve seen this season, he hasn’t looked any use either. He is about 25 or something and has not had any real interest from Premiership clubs either so he is as big a risk as people say Beckford would be. I’d prefer we used Kadar instead. About 5 years younger and already on Kilgallon’s level, if not better. Not sure if this has been mentioned but it could be possible that his agent has come out with this to try and get them to accept the offer we’ve made, as if they don’t then he’s quite happy to sit on the rest of his contract and then move on. Worry not lads, Killa will arrive with you in the summer. His staying has nothing to do with loyalty, his agent is leading him by the nose to play out the rest of the season at half pace so that they can both share the big signing on fee in May.